These are several of the treatment options available for patients of Dr. Radtke. Descriptions for some of the treatments are provided to help you better understand them. Laser surgery for diabetic retinopathy, macular degeneration, presumed ocular histoplasmosis, and retinal tears and holes is available at all of our locations. Cryotherapy for retinal tears and holes is available in our Louisville and Evansville offices. Vitreous surgery is done at Norton Audubon Hospital, adjacent to our Louisville office. Other treatment options, such as medicinal therapy and intraocular injections are also available. Dr. Radtke will inform you of all treatment options at your examination. Cryotherapy is a treatment option for retinal tears and holes. After the patient is given a topical or local anesthetic, a freezing probe is applied to the surface of the eye over the point of the tear or hole. The extreme cold penetrates to the retina and freezes only the area around the tear or hole. As the frozen area heals, scar tissue forms and attaches the retinal layers together at the edges of the tear or hole. The patent will feel slight discomfort during the procedure if given a topical anesthetic; if the patient is given a local anesthetic, discomfort may occur after the anesthetic wears off. 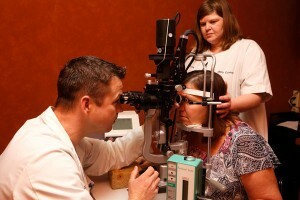 An intraocular injection is an outpatient procedure performed in the office. If an intraocular injection is indicated by Dr. Radtke, the patient will be given a local anesthetic by the doctor to numb the eye. When the eye is numb, a very small sterile needle is inserted into the eye to deliver medicine, or as a gas bubble into the eye. After the procedure has been completed, the patient’s eye pressure will be evaluated and a pressure patch applied to the treated eye. The doctor will specify the length of time the patch should remain on the eye, as well as any activity restrictions to be followed. A subconjunctival injection is an outpatient procedure performed in the office by Dr. Radtke. If this treatment is indicated, the patient will be given a topical anesthetic to reduce sensation in the front of the eye. The doctor will deliver a small amount of medicine around the eye with a small needle which is inserted around the eye. The needle does not enter the eye. Following this procedure, the patient may experience double vision for a short time and the eye may be bloodshot for a few hours after the procedure. No activity restrictions are given to the patient unless specified by the doctor. 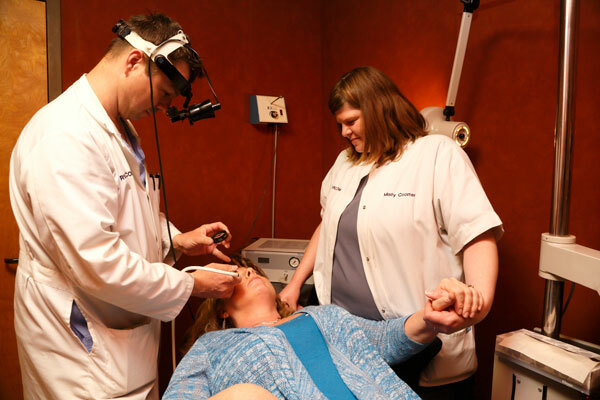 Laser treatment is an outpatient procedure. The laser creates a tiny burn at the point of a tear or hole and welds the separate layers of the retina back together. After a topical anesthetic drop is given, a contact lens is placed in the eye in order to hold the eye open and give Dr. Radtke a clear view of the area to be treated. Dr. Radtke will give instructions as to where the patient should look during the procedure. The patient may see flashed of red or green light that may cause a sensation of warmth and slight discomfort. Any discomfort from laser treatment should be minimal and should go away shortly after treatment. Following laser therapy, the patient may be cautioned to avoid strenuous activity if necessary. Information on medicinal therapy will be available as soon as research is complete. Photodynamic Therapy is the latest FDA approved treatment for those patients with growth of new blood vessels under the retina, called choroidal neovascularization. 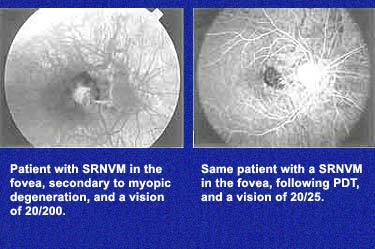 Conditions that can cause choroidal neovascularization include Age Related Macular Degeneration, Presumed Ocular Histoplasmosis Syndrome, and Myopic Degeneration. Photodynamic Therapy is a two-step process. A drug is injected into the patient’s system through a needle inserted into the patient’s arm or hand. The infusion of the drug takes ten minutes. After the drug is allowed to settle into the new blood vessels, a cold laser beam is used to activate the drug and destroy these bleeding blood vessels. Because the drug settles selectively into the new blood vessels, the surrounding retinal tissue is left relatively undamaged. If the treatment is successful, damage to central vision can be slowed or possibly stopped. Photodynamic Therapy is not the right treatment for everyone. Dr. Radtke will determine at your examination the best options for treatment based on the specifics of your disease. Retinal Laser Surgery is used for a variety of conditions, including diabetic retinopathy, macular degeneration, presumed ocular histoplasmosis, and retinal tears or holes. The laser beam is a high-energy light that turns to heat when it is focused on the parts of the retina to be treated. This is called photocoagulation. The laser beam can seal leaking blood vessels from diabetic retinopathy. Laser is also used to destroy portions of the retina that are so severely damaged by diabetes that they develop neovascularization, a common complication of proliferative diabetic retinopathy. In macular degeneration and presumed ocular histoplasmosis, laser treatment can be used to stop bleeding blood vessels in an attempt to prevent further vision loss. Laser surgery is also used to seal retinal tears and holes. In all of these conditions, the main purpose of laser surgery is to prevent further visual loss. A vitrectomy is a surgery that removes the vitreous gel that fills the eye. This surgery is indicated for several conditions including diabetic retinopathy, vitreous hemorrhage, retinal detachment, preretinal membrane, macular hole, endophthalmitis, and foreign bodies inside the eye from trauma. A vitrectomy is usually performed under general anesthesia. Three small holes are made in the eye in order for the surgeon to insert necessary instruments for the surgery. A tiny light pipe is used to illuminate the inside of the eye; a small hose-like tube, called an infusion canula, is used to replace the gel that is removed from the eye. The third hole is used for various instruments such as vitrectomy cutting tools, delicate membrane scrapers, and forceps. During the surgery, the vitreous gel is removed and replaced by a clear fluid. The surgeon may use delicate instruments to remove scar tissue and/or preretinal membranes. Intraocular laser may be used if a retinal detachment, retinal tear, or vitreous hemorrhage is present. In addition to vitrectomy, scleral buckling may be performed to repair a detached retina. A scleral buckle is a silicone band that it placed around the eye and kept in place with several sutures. The scleral buckle pushes against the retina; this helps alleviate pulling on any retinal holes. Retinal holes allow fluid under the retina, causing retinal detachments. Every surgery is unique because every eye condition is unique. There are risks associated with any procedure, so it is very important to talk to your doctor about your eye condition and the need for surgery.